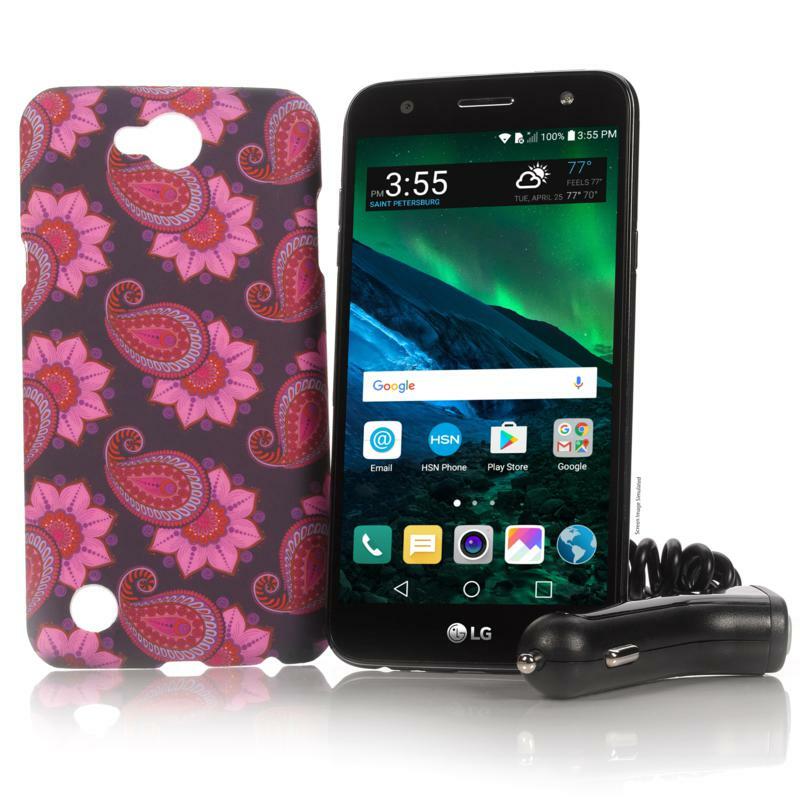 This week's Deal of the Week is the TracFone LG Fiesta 2 L164VL 16 GB LTE Android phone with with 1200 minutes, texts and MBs of data, one year of service, case and car charger for $89.95 at HSN. Shipping is free. The LG Fiesta 2 is one of TracFone's newest mid-range Android phones. It uses the Verizon network and runs Android 7.0 Nougat. Specifications include a Snapdragon 425 SOC, 2 GB of RAM, 16 GB (9.83 usable) internal storage and a 5.5 inch 720x 1280 px screen. The main camera is 13 MP and the front facing camera is 5 MP. The large 4500 mAh battery is non removable. USB OTG and WiFi 802.11 b,g,n are supported. The memory card slot accepts cards up to 2 TB. For more specs and features see this lg.com page. This is a good deal for TracFone customers as the airtime is worth $100 and the phone lists for $99.99. As with all of TracFone's recent smartphones, the Fiesta 2 is a "smartphone airtime only" phone. It will not get triple minutes, texts and data when a legacy TracFone minutes card is added. For more about the differences between TracFone's triple minutes and smartphone airtime only billing see this post. 4 Lines of $50 Unlimited Gigs Plan for $100 ($110 with Todo Mexico) Family plan promotion. New activations only, at least one line must be a port-in from a non-Sprint based MVNO or operator. 4 or fewer lines $100, 5 lines $125. Ends 1/29. Buy One Phone Get One Free with activation of a new line of service on the $50 unlimited plan. iPhone SE 128 GB $199.99 (reg $499.99). Four Lines of Unlimited Data For $100 For a limited time get 4 lines of the $55/month Unlimited 2 Plan for $100. Free and Discounted phones for port-ins: Alcatel Verso Free, LG Fortune Free, ZTE Overture 3 Free, CPO Alcatel One Touch Flint 99¢, CPO ZTE Sonata 3 99¢, CPO Alcatel Streak 99¢, CPO Alcatel Pixi Theatre 99¢, CPO Samsung Galaxy Sol 99¢, CPO HTC Desire 520 99¢, CPO HTC Desire 625 99¢, CPO LG Risio 99¢, CPO LG Spree 99¢, Alcatel PulseMix $9.99, LG Harmony $19.99, Alcatel Idol 3 $19.99, Samsung Galaxy Amp Prime 2 $29.99, ZTE Blade X $29.99, Alcatel Idol 4 with VR Goggles $39.99, LG X Charge $49.99, Samsung Galaxy Halo $69.99, HTC Desire 555 $69.99, LG Stylo 3 $79.99, ZTE Blade X Max $79.99, Alcatel Idol 5 $129.99 when you port your number to Cricket. Ends April 12. Price below are for new activations without a port-in and current customers upgrading their phones. Upgrades are subject to a $25 device upgrade fee. Unlocked T-Mobile Samsung Galaxy Note 4 N910T LTE Android phone (manufacturer refurbished) $139.95 Free shipping. Unlocked GSM iPhone 5s 32 GB (manufacturer refurbished) $149.95 Free shipping. Verizon (or Verizon MVNO) Samsung Galaxy Note 4 N910V LTE Android phone (manufacturer refurbished) $154.99 Free shipping. Verizon (or Verizon MVNO) Samsung Galaxy S5 G900V LTE Android phone (new) $174.88 Free shipping. TracFone Samsung Galaxy Luna Pro (Verizon) 16 GB LTE Android phone with 1500 minutes, texts and MBs of data, one year of service, case and car charger $89.95 (reg $89.99 w/o airtime) Free shipping. TracFone Samsung Galaxy Luna (Verizon) triple-minute LTE Android phone with 1200 minutes, texts and MBs of data, one year of service, case and car charger $99.95 (reg $79.99 w/o airtime) Free shipping. TracFone LG Sunset (AT&T) triple-minute LTE Android phone with 1200 minutes, texts and MBs of data, one year of service, case and car charger $99.95 (reg $99.99 w/o airtime) Free shipping. Two lines of the unlimited $50 plan for $80 when you port a number to MetroPCS. Free Phones for port-ins: The LG Aristo, Moto E4 or Samsung Galaxy J3 Prime are free when you port a number that's not currently active on T-Mobile network to MetroPCS. In stores only. Updated 1/17: Price cuts and new deals since Sunday are in bold. Boost Moto E4 $39.99, Virgin Mobile Moto E4 $39.99, Boost Moto E4+ 16GB $69.99. Best Buy. Are these like the Verizon verizon version, where they could be unlocked for a couple bucks to work on any network? Boost and Virgin phones have to be used on Boost or Virgin for 12 months before Sprint will release them for use on Sprint MVNOs or unlock them for use on non-Sprint networks. The Sprint version is the XT1766. You can get it unlocked on eBay, like the Verizon Prepaid model, but the going rate is $20, not $2. Is that also the same as the version Verizon version Verizon? Or the Virgin version ? from experience, if you buy the verizon version, get it unlocked, and try to use it on a verizon mvno, verizon will brick the phone. it may work for a few hours, but ventually they will disable it, they did it overnight, in my case. i would expect sprint to do the same. and, since phones from those carriers can roam on each other's network, you will get bricked even if you try to use one,s phone on the other's mvno. Bricking refers to a state where a phone doesn't turn on or won't complete its boot up sequence. Verizon doesn't brick prepaid phones on MVNOs if haven't had their subsidy ransom paid, they block them from working on the Verizon network. Blocked Verizon Prepaid phones, if unlocked, will work on AT&T and T-Mobile based networks provided they support the bands and technologies used by those networks. 1) Boost and Virgin phones can't be used on Sprint postpaid and, with the exception of Virgin Inner Circle phones sold at the full Apple Store price, must be used for 12 months on Boost or Virgin before they can be used on a Sprint MVNO. 2) A Sprint postpaid or "universal unlocked" phone that has been used on a Sprint MVNO must be "reSKUed" by Sprint before it can be used on Boost, Virgin or Sprint postpaid. Very few Sprint reps are willing and able to reSKU phones. 3) Most Sprint phones are double locked. There's an global SIM lock that prevents the phone from accepting any non-Sprint SIM plus a domestic SIM lock that prevents a global unlocked phone from connecting any US networks except Sprint. Many 3rd party unlocking services can only unlock Sprint phones for international use. If purchasing an unlock for Sprint verify that it includes a domestic SIM unlock (DSU). The bottom line is that you should only buy a Boost or Virgin phone for use on Boost or Virgin. "Boost and Virgin phones can't be used on Sprint postpaid"
This may be a policy, but it is not true. Our Boost iPhone 6S Plus passed the Sprint online tests for use on Sprint postpaid. So did our Verizon iPhone 7, unlocked AT&T iPhone 6S and unlocked iPhone 6S, which all were activated by Sprint on postpaid, BYOD. Boost iPhones locked to the Sprint network can also be used on Virgin Inner Circle BYOD if they have been inactive on Boost for 60 days. This is listed in a Virgin FAQ. Referring to Dennis'(Jan15,@11:30am), thanks for the info. We also come across, especially Moto's with 'all US carriers compatible', 'Universal'. Can you pl. clarify if there are any gotchas with such phones? Thanks! For the 32gb/2gb ram version, not a great price frankly. If it was the 64gb/4gb ram model the it would be the deal of the week. Is there a lower price today for a new, US Moto G5 Plus from a carrier or major retailer? If you need it today look around and see, it has sold for less during holidays. The better version could be had for $200 from Fry's & a bit under $220 from Best Buy (less if you sold the bundled Cricket airtime). AFAIK the G5 Plus is not sold carrier branded. If you don't need it today this is not a best price. Actually Fry's had the higher spec. one for $185 at one point. Amazon has the better one w/lock screen ads for $200 a few times. Republic wireless had it for $215. Was never really interested in the 2gb ram version so I was not following it as closely but I know it was $175 on several occasions from several vendors, wouldn't be surprised if it was $150-$160. I looked today and could not find it for less than $199 from a major reputable source. Closest I found was $200 from Consumer Cellular. This post is phone sale prices this week. Old holiday sale prices aren't helpful if you need a phone now. All phone prices go down if you wait and wait. As long as you realize its no good deal at $200 GI ahead and buy if you must. Of course prices go down with time, the point is this phone was less when newer. This column is about good phone deals/prices not ho hum average price for the particular model you must have today. Sprint’s ‘Direct Connect Plus’ PTT service from Kodiak/Motorola Solutions (US company) launches. Pay $5/month, install app on iOS or Android. Or use a Kyocera phone with service support and button built in. why not just get the new honor 7x for $199? Isn't the screen size on the Honor 7x larger ? "why not just get the new honor 7x for $199?" any phones around 50 dollars for tmobile or phones that could be unlocked for tmobile through ebay? Aprreciate any advice. Hello Dennis, I've activated my own phone on Net10, in the past I've used Net10 branded phones. Regarding voicemail, do I have to program a phone number into #1 speed dial to retrieve messages? Or does the network configure it automatically? They've already texted the APN settings. On most phones the 1 key dials voicemail automatically. But if it doesn't you can set up a speed dial to do it. Dennis We are missing your " Prepaid Phones on Sale This Week:"
Hi Dennis, I am missing my Prepaid Phone Deals fix this week. Suffering from severe prepaid device withdrawal here. Plus one! Really really missing the weekly phone deals updates! Me too! Guess I didn't realize how much of a phone junkie I am until I don't get my Sunday fix. is this the end of the weekly deals posts?? Hopefully he is on the most and and will be posting soon. "most" above should have been "mend"
I really hope this isnt the end of the weekly deals page. Its by far, the biggest reason I keep coming back to this website! Anyone have a recommended ebay unlocker? I use to use mobunlockingmaster, but that was a year ago, and he long gone. I have a moto g4play xt1607 i need unlocked, as well as a few crickets zte x3 and x4... cheers! hope for deals page to make a come back! Hope that the phone deals each week come back. Absolutely love looking at them. One of many reasons I come to this site.